The 24" Champion Sports Baseball Size Foam Covered Bat features a tough foam cover over a durable core. The soft coating is safe for all ages! 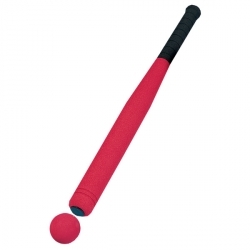 This standard baseball sized bat has a thicker barrel and grip, and is a safe, fun way to practice and play. Each bat includes a soft foam ball.